In this series of postings we are reviewing the seven steps of The Success Habit Secret.. Step 5 is about creating momentum through continuous action, following the 21 days creates a habit concept. Step 5: Commit to following your plan for at least 21 days. In Step 1 you described your goal in very specific detail, and in Step 2 you explored the strong positive feelings connected with your goal, Step 3 asked you to identify actions you will take to reach your goal, Step 4 asked when exactly you will take action. Now, in Step 5 we will build momentum with a 21 day start. Ready, set, go! You know what you want, why you want it, what you’re willing to do to get it, and you have a schedule for taking action. Now, let’s get things moving and build momentum by consistently taking action for 21-days. There is an old saying, “Do something for 21 days and it will become a habit.“ I use this idea in my book, The Success Habit Secret, and with clients who want to make positive change in their lives. 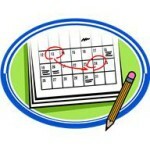 The key to the 21 day concept is that it keeps the focus on the goal and goal plan. Day by day, week by week, joyfully move towards what you seek. — Ready -Set -Go! Or, complete this form for a FREE Evaluation and Goal Setting Support.